BMW 3 Series teaser released | What Car? BMW has released this teaser image of the all-new 3 Series. 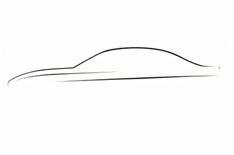 The sketch suggests that the new 3 Series will be strongly influenced by the latest 5 Series, with a similarly curving bonnet line and sculpted sides. BMW is yet to confirm technical details, but the 3 Series is expected to be slightly larger overall. A range of new turbocharged engines are expected to give lower fuel consumption and CO2 emissions. Currently, the cleanest 3 Series is the 320d Efficient Dynamics, which emits 109g/km of CO2. A sub-100g/km version of the new 3 Series is a tantalising possibility. Prices are expected to rise slightly, but standard equipment is also likely to be increased. BMW will release full details on Friday, October 14. Well have the full story including photos and UK prices on whatcar.com.